This week, we look at the Supermanbooks cover-dated August (or late august) 2007.In Action Comics 851, “Last Son” picks up, and then drops the ball. Big time. 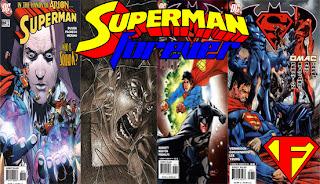 Superman takes on the Phantom Zone,Dev-Em, Mon-El, and Luthor himself as Kryptonians conquer Earth, Superman 664 brings a battle with Arion, Squad K, the Justice League, the Justice Society, and the Prankster. Superman/Batman #36 brings the Metal men storyline to a merciful close, with Superman and Batman taking on the Metal men, Brainiac in an OMAC body, and the perils of being an orphan. And Batman throws down with killer Croc, while Superman wonders about Pete Ross‘s intentions, and the Kryptonite spires forming in metropolis in Superman/Batman #37. Don’t forget to tune in Sunday when episode 29 takes a look at Krypto and the Super-pets.